Twickenham – we had one step forward, now it’s two steps back. They’re starting the detailed designs for Twickenham, and it’s not good news. We’ve tried hard to engage the council, and to push the focus that both LCC and the Mayor’s Office are giving to ‘Going Dutch’. A previous meeting seemed to indicate that things were really starting to look positive, but the new plans (PDF here) are very disappointing indeed. Advisory cycle lanes that share the width of the nearside motor vehicle lane and disappear where they’re needed most. At junctions, where most collisions occur, those on bicycles have to fend for themselves, great if you’re trying to cycle to school with your children. And the newly located bus stops, aside from inconveniencing those who visit Twickenham by bus, add new dangers along Cross Deep. In the week that saw the first death in London on a hire bike, Richmond Council is again offering us a design based on the discredited and dangerous facilities that bloggers like Twowheelsgood and Citycyclists are directly linking with the continuing maiming and death of cyclists in our city. A painted line will do nothing to protect you from an impatient lorry driver. Cycling *is* a safe thing to do, and our borough is a pretty safe place to do it, as well. But we know from report after report that the people who aren’t already using a bicycle have probably chosen not to get on a bicycle because they perceive it to be unsafe. And the new Twickenham plan isn’t going to help. We’ve written to the council to tell them how concerned we are (you can see the full text at the bottom of this post). Perhaps Richmond can win its Mini-Holland bid, because there’s indications that Twickenham might be partially fixed with that, but we can’t risk it: right now the borough is bidding to spend £8m of TfL’s cash on the new Twickenham, but it’s neutral at best for cycling. We think Twickenham is somewhere that should welcome families and visitors by bicycle, whether they’ve come from nearby, or from the station, or are just popping in to get a loaf of bread or a coffee. The Cycling Liaison Group meets this Thursday – the meeting is open to everyone so join us to ask the council why they’re giving so little priority to persuading people that cycling is a pleasant attraction option for getting around our area. If you’re planning to come, drop us a note at campaign@richmondlcc.co.uk if you need any more info. Thank you for sending us the detailed plans for Twickenham. Unfortunately, it is very hard to see how RCC can offer any endorsement for the plans as they stand. As you know, we were very pleased to see Andrew Gilligan and Boris Johnson bring together a real commitment to cycling for everyone. We believe that getting on a bicycle can – and should – be the most obvious travel choice for the majority of journeys in our borough. We also believe that to get people to consider cycling as a transport choice it needs to be safe and feel safe. Survey after survey tells us that people who don’t cycle equate sharing the road with HGVs and buses with a very visceral feeling of danger. You’ll have seen recently that the local police are finally enforcing the cycle lane across the bridge by the station: the ongoing issues here are a perfect demonstration of why cycling needs its own space in the new Twivckenham, and yet the nearest concession to any new space comprises a couple of advanced stop lines. These plans give little confidence or succour to mums and dads who want to cycle with their children to school, or indeed anywhere else in Twickenham. Instead they combine all the features which make cycling in the United Kingdom a specialist contact sport. They include; incomplete routes; junctions that require a cyclist to force her way into the main traffic flow; conflict-inducing pinch points, and hair-raising junctions. We discussed using ‘armadillos’, soft kerbs and a range of other techniques to indicate lane provision. Not Present. We discussed how someone on a bicycle makes it from York Street across Cross Deep to Heath Road. Your new design doesn’t even provide a cycle lane for most of this journey. A key point from the Gilligan review is that you can’t have a meaningful cycle route if you do nothing at the junctions. Yet this plan offers virtually no improvement at junctions compared to Twickenham currently. The mayor of London has a compelling vision for cycling for everyone in our city, and it is with huge regret that I have to tell you that I don’t think the plans that we’ve seen do anything to advance that vision. This entry was posted in Consultation, Cycling Liaison Group Meeting and tagged Campaign, Go Dutch, LBRUT, Twickenham by Campaigns. Bookmark the permalink. Excellent letter, in response to what is simply showing the complete lack of understanding either Politicians or Councillors have re getting people out of cars and onto bikes. * who are these proposals designed for and what are the expected benefits / disbenefits? * Why are all the ‘best practice’ facilites in the Twickenham ‘mini-Holland’ bid converted to bad practice here? * why is Atkins involved in the proposals & bids & do they have relevant expertise in designing cycle safe infrastructure? Can’t see any relevant experience or expertise on their website, so maybe thay have not got a clue & are getting paid for making it up as they go along. 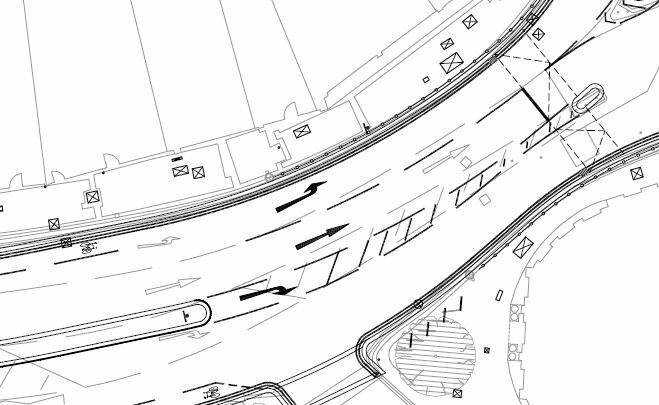 * motorists don’t enjoy having cyslists threading through the traffic so these plans don’t suit motorists. *if cyclists don’t feel safe, they will either ride on the pavements (inconveniencing pedestrians) or get in their cars (inconveniencing other motorists by increasing traffic congestion and incoveniencing everyone by causing more polllution). * why have all the RCC contributions been ignored? * who are these guys accountable to? Is it voters or are the planners not accountable to voters? It was interesting that AFTER the CLG Chris Smith – head of highways planning- told me that the plans were only outline and that not all our ideas had been rejected. Paul L, I cannot understand why Chris Smith is having this game played with him. I became totally fed up with complete lack of interest in my 1.5 pages of specific proposals which I met and discussed around the table with Chris Smith, Zeb, Ben Fryer and last but seemingly least Cllr Chris Harrison, who has zero patience for anything apart from Officers advice. So my 1.5 pages tabulated by Chris has become simple shelfware. There is no interest in addressing your totally correct comments and by the RCC/LCC, and is ultimately one major reason why I resigned, because there is no detectable reason, logic or process when I represent so many in Twickenham who have clearly expressed common sense about cycling . This plan is one step forward from the original, but simply is not worth the paper it is printed on. I tried and tried to make changes from within, but simply not one person seems to have a creative bone between them. Well I feel sorry for Officers, because they are simply not giving us the goods. I will not allow this nonsense to continue. If Lord True wants one of many reasons why I couldn’t stomach the hypocrasy of Top Down nothing has changed/we know best, just like the last idiots who did nothing here of any great worth in 25 years, not least because there is a bone headed leadership who so often totally ignore what I have been saying on the ground. First request to Officers I made, please include cycle lanes throughout Twickenham Town. The first plan was just laughable, but then Chris Smith and Cllr Chris Harrison whom I have only ever seen him drive one of his two Mercs or on bus but neved on bicycle, like every Twickenham Councillor apart from Cllr David Marlow who is simply clueless and always whips the party line, as his role was to try to real me in, none of these people, not Cllr Susan Chappell, nor Khosa, Acton, Porter, or even Cllr Head who simply cannkt cycle. There is so much wrong with the plan the only way of dealing with this is whst I am pretty good at, make a huge noise, I cannot let this carry on with a Project Board who simply are not accountable or listening to the blooming obvious. Email me on cllr.snaylor@richmond.gov.uk or call me on 07973 186183 to arrange a meet up, I have no whip to tell me any more to not vent and get the right thing done. Cllr Scott Naylor, Twickenham Riverside Ward. It’s a shame that cllr. Naylor has decided to use this issue as a political football. It appears, if he is to be believed, that his former colleagues, the opposition and even the council officers are at fault and the solution is simply to adopt his suggestions! Can everyone else be so wrong and one man so right? It is desirable and constructive to discuss the issues and decisions made by the current administration, but to lace any such a study with the sort of play ground name calling that SG uses is surely, not only rude, but counter-productive. We should be seeking compromise and a mutually agreeable plan, not fuelling the fires of controversy. Cllr. Naylor’s reasons for crossing the floor of the council chamber to represent UKIP (a tiny minority among local voters) may include the reason given – but surely it has more to do with the fact that ordinary members of the local Conservative party decided that there were other, more worthy, candidates to stand in the Riverside ward. He may be ‘pretty good at, make[ing] a huge noise’ but doesn’t appear to be capable of producing anything else – unless you count his participation in keeping Twickenham Station looking like a third world eyesore until after rugby fans from around the world come to our town in 2015. And frankly his division of the world into cycle riders (good), non-cycle riders (bad) is as comic as it is disturbing. Oh dear, oh dear, indeed! If only Cllr Naylor had spoken out at the variety of Council meetings last year about the Highways scheme and the ‘purely cosmetic’ cycle lane plans we might not be in the mess we’re in now. Why was he so dismissive of the positive suggestions and proposals made by Richmond Cycling Campaign, myself and many others back then when it might have made a difference? Why didn’t he listen to us when it mattered, rather than publicly poo-pooing our proposals for safe, continuous, and (where possible) seggregated cycle lanes through the centre of Twickenham. Sadly, the ‘huge noise’ he is now making is all about self-promotion, and nothing to do with listening to and representing the Riverside residents who elected him. I suggest he gets on his bike asap and peddles off to UKIP towers for good. Maybe this is the verbal kick up the backside Lord True needs to hold a by-election for Cllr Naylor and Cllr Salvoni’s positions.